Agencies are always on the look-out for some new path to the waterfall, a methodology for developing the kind of advertising that will not only generate monstrous profits for their clients, but will also create for themselves lucrative new business, leverage when negotiating retainers, good press in the important media, and the occasional bright shiney object at the kind of international awards banquets that creatives invariably show up to drunk. Clients too have their ears to the ground for such methodologies, relentlessly poking and prodding their current – as well as their once and future – agencies for some tangible “thing” that will take this ultimately intuitive business and quantify it for them – or at least quantify it enough so that they have something plausible to say when their bosses call them to the “how-come room” (“How come you chose this agency? How come you chose this campaign? How come you spent all this money and how come your sales are still in the toilet?”). This quest is always more challenging for clients, not only because they’re the ones who have to pay for it (if an agency’s new kool-aid isn’t working they can just change it; if the new kool-aid isn’t working for the client, he may have to change his address…) but because in truth there is often a very fine line between a cutting edge insight-machine and a large sock full of horse manure. In the 1990s in the United States, the exciting new path – or sock of manure depending on your perspective – was “Account Planning”, a discipline allegedly invented thirty years earlier in the UK (by Stanley Politt at Boase Massimi Politt – though Australia contends it was invented by David Brent at Thompson Ansell Blunden at roughly the same time) and imported into the U.S. by Jay Chiat. In 1982, Chiat hired Jane Newman (formerly of BMP), and over the course of the next decade his agency’s billings rose from $50 million to $700 million. Numbers like that get the attention of agencies, so seven years later, Goodby Silverstein and Partners hired Jon Steel (also formerly of BMP) to found and head up their Account Planning department. And ten years later Goodby’s billings had increased from $40 million to $400 million, and Jon Steel had written this book explaining why the whole idea wasn’t just a bunch of hooey. And in a way, that is precisely what good account planning does. It takes the chaotic mixture of stakeholders, focus groups, competitive research, IRI data, client wish-lists, agency needs, year-old strategies, legacy costs and god knows what else, and organizes it in a way that is useful, meaningful and actually inspirational. It can take the vague and indecisive and unclear and turn it into the kind of insight that not only makes sense, but actually gets you excited to work on the project. As my friend Tad Kittredge (who gave up agency life for the glamour of the client side) once said, “I know I’m writing a really good brief when even I start generating ideas even as I’m writing it. That’s because account planning – and I hope I’m not emasculating the practice by oversimplifying – is a systematic approach to developing insights that will enhance creative concepts. It is more formal (and theoretically more effective) than arguing about the relative merits of each other’s instincts or, as is more likely, the opinions of grandmothers, spouses and neighbors, and at the very least gives you something other than yourself to blame when things go south. And yet for all its formality, it still can be employed with great creativity, imagination and genius to generate all manner of lucre. At least, when it’s done correctly. Which Jon Steel shows you how to do. 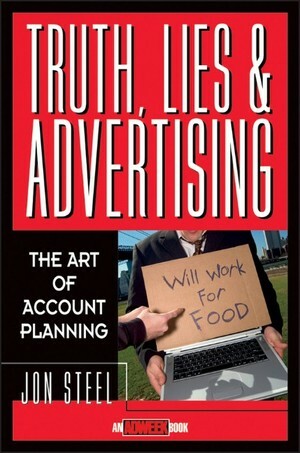 Truth, Lies & Advertising by Jon Steel was published by Wiley on 03/13/98 – order it from Amazon here or from Barnes & Noble here – or pick it up at your local bookseller (find one here).